Earlier this year I finally got my eyes checked for the first time. I never really thought I needed glasses, but I mostly just wanted to make sure my eyes were in good health since I had never had an eye exam. While I have pretty good vision, I do have a relatively weak prescription, so I finally got some glasses, courtesy of Firmoo! Product sent for review. All opinions are my own. I've had my prescription since about April, but finally got these glasses since Firmoo offered. I considered getting glasses straight from the optometrist where I got my eyes checked, but they were so expensive! Since my prescription isn't really vital to me being able to function, I decided not to get any while I was there. However, I'm so glad that I actually got some, and it's thanks to Firmoo! While these were provided for review, I am honestly very happy that I got glasses in general, and I've been enjoying these ones so much that I actually ordered a second (different style) pair from Firmoo! And, the ones I ordered were a fraction of the optometrist's price. Each pair of glasses also comes with a hard case, soft storage pouch, cleaning cloth, and screwdriver with extra screws. You can see the hard case and cleaning cloth at the top. These ones for my review are titanium. I got to choose from lots of different styles, but I really liked the look of these half frames! It seems that the front is actual titanium, so it is very sturdy but also very light. The arms came in a variety of colors, but I opted for Gunmetal. These arms seem to be a different material, which I think is just plastic, but they have been sturdy and comfortable so far either way. The construction and materials seem great! I was afraid that they would be too wide, big, or heavy for my petite self, but they are not loose and stay in place nicely, and they are not too big for my face. While I love the look of thick rimmed, full frame glasses, I am glad I got these half frames since they're not as overwhelming. I wear a lot of eye makeup usually, so it's not too distracting too. The glare in this photo looks a bit green, but my camera actually picked up some glare that you really don't see with the human eye! I did opt to pay for the additional anti glare coating on the lenses, so that might have to do with it. In person, there is no glare on the lenses, which helps for me driving during the day, but also for people who are looking at me! The frames are very comfortable since they are so light too. Since I'm newer to wearing glasses most of the day, heavier frames make the top of my ears sore after a while! But it's probably also because my hair is weighing down the arms and adding to the weight. Either way, I don't get that with these frames, and I love them so much that they're my go-to pair! So if you're in need of glasses, head on over to Firmoo.com. They have so many inexpensive frames for both glasses and sunglasses, and so many additional options to add to your lenses. And if you don't have a prescription, you can also get non-Rx glasses or sunglasses too! 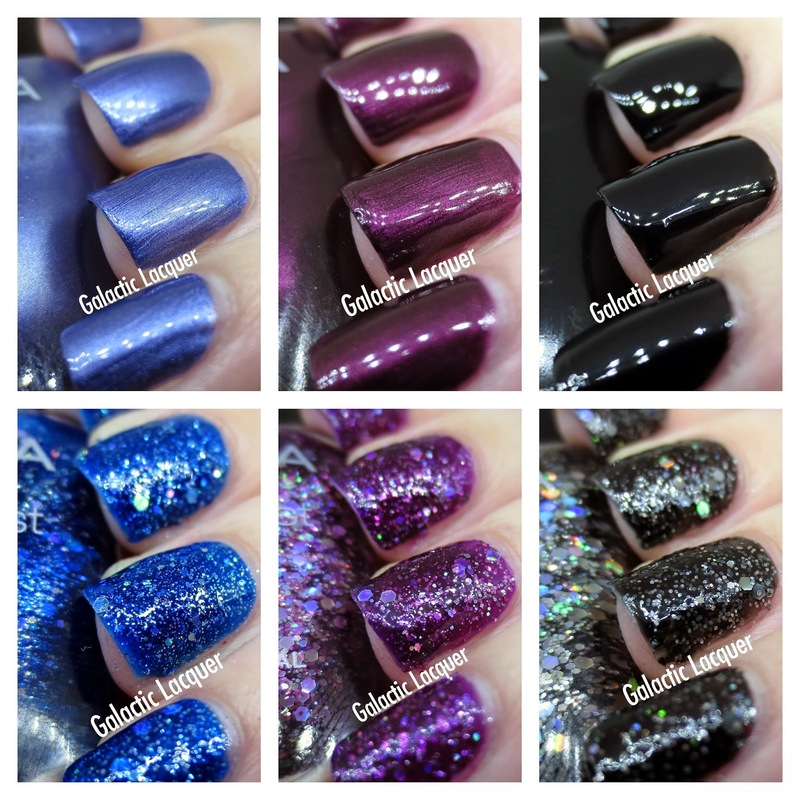 On December 12, Rainbow Honey had announced a Winter/Holiday nail art giveaway! I saw the post, and it got me to finally do some winter nail art. I haven't had too much time this year to do anything too crazy, but I though at least some snowy sparkles would be nice! I waited a little while to post it since it was a new manicure created just for the nail art contest, as their rules stated it should be new. So to avoid any confusion, I just wanted to wait until the contest was over, but I still wanted to share it with you all! I didn't do anything too terribly special, as I mentioned before, but I did manage to use all Rainbow Honey products too! I started off by using Heron 36 as my base color, which took two coats. I then applied a single coat of Snow and Lights to add a little sparkle and color. I also had some loose nail art glitters called My Snowy Valentine from Rainbow Honey, so I used 10 of the large, white snowflakes from there. I separated 10 snowflake pieces before beginning to paint my nails, and since they're so large, I bent them a tiny bit between my fingers to get them to curve a little. It really helped them contour to my nails! I then finished off fish a coat of Seche Vite (okay, a non-Rainbow Honey product!) to seal the snowflake glitters in. But I did also apply another layer of scented Rainbow Honey topcoat in Muscovite on top too. I'm very happy with how it turned out! I was afraid that Snow and Lights would be a little too blue at first, but I think it helps the snowflakes stand out, and it also helped the cooler tones of Heron 36 show through too. Now I want to do more holiday/winter nail art! Hey everyone! It's time for me to purge my collection and organize again, so it's time for grab bags! Each grab bag will be mailed via USPS small flat rate box. You will receive 5 full size polishes inside each one. You may get a 6th full size polish, some mini polishes, and/or some nail art supplies too. I'll fit as many extra goodies in there as I can! However if you would like two grab bags, I will ship both in a USPS medium flat rate box for $30 shipped. This medium box actually fits about three or four times as much as the small flat rate box! Cremes, shimmers, or metallics? Or all of the above? Do you like glittery polishes? Fine glitter or chunky glitter? Metallic glitter or matte/satin glitter? More indie or more mainstream polishes? 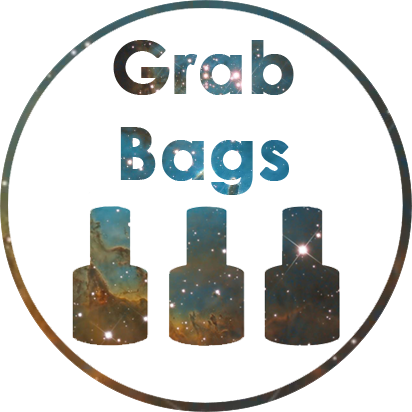 I am only selling grab bags to residents of the US due to shipping restrictions and costs, sorry! Please email me if you would like one, and then make a payment to me via Paypal with the "gift" option. If you do not feel comfortable using the "gift" option, please let me know via email so I can create an actual invoice (PayPal fees applicable). Once the transaction is complete, I will purchase/print your USPS mailing label and email you the tracking number. All grab bags will have tracking information included! All sales are final, no returns and no refunds. I am not responsible for lost or damaged items, sorry! However if items arrive broken from transit, please send me an email so we can work something out! A while back I received a set of stamping plates from Born Pretty Store. I'm actually sort of unfamiliar with stamping, as I just haven't gotten the opportunity to use any plates. I tend to do freehand designs or just go for some glitter when I do nail art, but I finally got to see what it's all about! I decided to test run a couple of patterns from two different stamping plates for this review. I used a poinsettia or snowflake design from plate BP09, and a leafy pattern from plate BP05 (further below). First up, BP09! I'm pretty new to stamping, so you can see some flaws in my work. However, I think it turned out better than I expected! I only tried stamping a couple times previously, but didn't have any good results. However, this worked great on the first try! I started off by painting all nails with two coats of Zoya Livingston. I then waited for all nails to dry completely. After they were dry, I used a white Konad polish on the plate, scraped off the excess (with a stamping plate scraper), and then firmly pressed my stamp onto the pattern. I quickly took the stamper and then rolled it across a nail to try and get the pattern to wrap with my curved nail. It worked great! I did each nail individually (you sort of have to!) and really was getting the hang of it by the end. I did my right hand last, and I think it actually turned out better! The only flaw I can see with this design is that some spots weren't filled in all the way. I'm unsure if the plates weren't etched deep enough, or if it was just user error since I'm sort of new at stamping. Since I had great results with an actual stamping polish like Konad, I decided to try something else when I tried out the BP05 plate. I started off by painting all nails with two coats of China Glaze Holly-Day and then waited for it to dry completely. I then used Zoya Brooklyn for the stamping, using the same method as above. While Brooklyn isn't the most opaque gold polish, I love how it turned out! It isn't too solid or stark against the green, and makes it look more like printed wrapping paper. Since the gold is metallic, it actually shows up a little better in person and really catches the light at some angles. I feel like this pattern filled in better than the BP09 pattern I used though. Either way, I am very please with the results! I am so happy to have some nice stamping plates finally, and ones that I actually got to work! 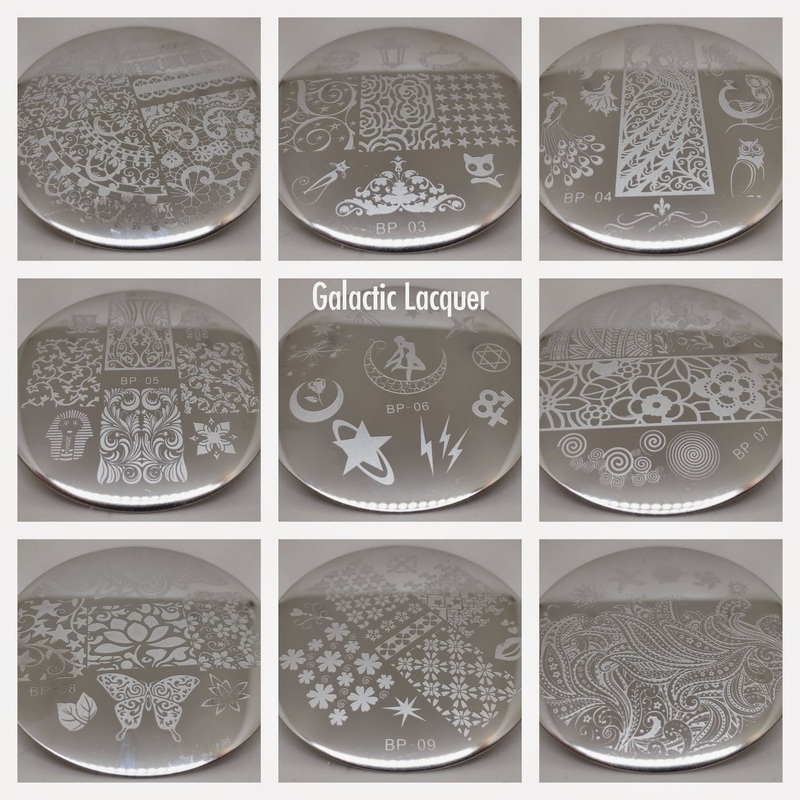 If you would like to purchase stamping plates from Born Pretty Store, they have these and then plenty more to choose from here: http://www.bornprettystore.com/born-pretty-stamping-plates-c-268_94_652.html They also have lots of other great nail art supplies! 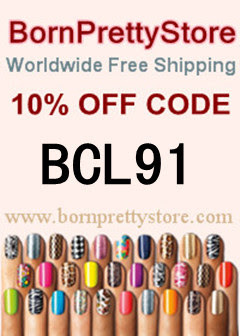 If you order, don't forget to use code BCL91 for 10% off too! It's been a while since I used an old favorite - Essie's Shine of the Times. I absolutely love this flakie topcoat, and it looks stunning over a variety of colors. Honestly what made me go for a flakie was seeing ILNP's new Ultra Chrome Flakies, which got me thinking how pretty they are, yet how long it's been since I used a lot of them! Every time I used this polish, I am reminded of how gorgeous it is. I remember purchasing this bottle years ago now, as I believe it was part of Essie's 2011 holiday collection, specifically one of the Luxeffects. The flakes in it are a little small, but they are quite dense, so they build up quickly. I didn't want to use it over plain black this time (although it looks amazing over black!) so I applied it over a plum shade to be more seasonal. I applied two thin coats of Shine of the Times over two coats of Milani Hipster Plum this time. I am loving how the orange, gold, and green contrast with the deep purple. I think it actually looks even more surreal and classy than it does over black! I might have to try it over burgundy next. I honestly love this polish and am quite sad that it can be difficult for people to find sometimes, as it is from a collection that is now almost three years old. However I sometimes see it stocked on Amazon and other online retailers, so if you see it, I recommend grabbing a bottle while you can! Yes, I am somewhat of a Rainbow Honey addict. But their polishes are great for both what's in season and not! I thought I was swatching a lot of colors that were more appropriate for fall, or had done some holiday themed nail art, so it was time for something different! I suppose this could also be somewhat of a "last hurrah" for summer though, as it's even starting to cool down here in Florida. I wanted to do something bright and crazy, and Best Friend was just perfect for that! The neon glitters in this polish make me think of summer, but they also really make me think of the late 80s and moreso the early 90s. I am absolutely in love with the glitters in this polish - both the shapes and colors. I really like how some of the hexagons are neon pink, but some are also a more unique coral shade. The yellow hexagons are also more of a golden yellow in person, and they're gorgeous! And my favorite part about the glitters is the black and white triangles! I wanted to do somewhat of a glitter gradient with Best Friend, but ultimately I ended up covering most of my nails. I'm okay with it though, and I love how it turned out! I used Rainbow Honey Prussian Sky as my base, and I am also loving this color. It is a bright blue with a bit of shimmer in it. Paired with the shimmer in Best Friend's base, it contrasts well with the flat, matte glitters! Last month, Rainbow Honey released three new additions to The Yokai. You may remember that I revisited and reviewed Kitsune, Oni, and Kawako with you all to celebrate the two year anniversary of the original release of The Yokai. Well today I have one of the new additions - Hebi! Hebi is a gorgeous deep teal color. Hebi is supposed to represent the snake, and this deep but shimmery polish does the reptile justice! However, these photos do not do it proper justice! This polish honestly has a wonderful depth to it in person that just can't be captured. Hebi covers great in just two coats. It is almost a jelly, but more of a crelly due to how dark it is. It builds up very easily, and since it is not entirely opaque, it gives a gorgeous depth. All of the shimmer is absolutely stunning, and it shines mostly green and blue, but there are hints of gold, purple, and even orange. I'm really glad that I picked up the new Yokai trio! I will have to try out the other two now. I purchased Hebi from Rainbow Honey's shop at http://www.rainbowhoney.com/. Each full size polish is $10. I had the wonderful opportunity to try out the new Wishes collection from Zoya and share it with you all. Wishes is the winter holiday 2014 collection, and it consists of six stunning shades. This time the collection is split between three "normal" polishes and three PixieDust polishes. Haven- True holiday plum liquid metal with a thin vein of orchid for added brilliance. Willa- Full-coverage, onyx black cream. Prim is a beautiful velvet blue shade. It is very metallic, but the super-fine flecks that it is made up of add to the velvet effect. Prim covers surprisingly well, and it is almost a one-coater! I applied two coats for good measure though. You can see some very faint streaks in it, but I feel like this happens with just about any metallic polish like this. Just don't overwork it and it will look great though. Willa is a great black creme. This polish is pretty simple since it's just that - a black creme. However it's great since I actually don't have any flat black Zoya polishes. Raven is close, but Raven has a very subtle, slight shimmer to it. With just one coat, Willa seems a little sheer, but adding a second coat makes it super opaque. I used two coats for these photos. Haven is a gorgeous purple shade with brighter light-catching flecks in it. I feel like Zoya has been releasing amazing purple shades this year, which is perfect for 2014's radiant orchid theme! Haven is also a metallic made up of super-fine metallic flecks, so you can barely see some super-fine streaks in it. However the streaks are even less noticeable than in Prim, and again, you won't have any issues if you don't overwork it. I used two coats of Haven. Thea is one of the three PixieDust polishes in this collection, and is almost the PixieDust version of Haven. The shade of purple is a gorgeous orchid color, and is somewhat of a jelly. One coat is a little sheer, but it builds up very easily with a second coat. I applied two coats for these photos. While Thea is one of the PixieDust polishes, I don't feel that it is super textured. I suppose this is good if you like a little texture without it being like sandpaper. While it doesn't look super textured, you can definitely feel it a bit. Nori is a beautiful blue PixieDust polish. Like Thea, Nori has lots of holographic glitter in it. It also isn't super textured, which is sort of nice. I guess with these not being intensely textured, they are also easier to apply a layer of topcoat over, if you want to just enjoy the glittery polish without any texture. Nori appears a little darker in the bottle, but brightens a bit on the nail since it is also somewhat jelly-like. While it is also sheer in one coat, it easily builds up in two. Imogen is the last of the PixieDust polishes in this collection. This one really caught my eye for some reason, and it looks almost like outer space with all sorts of varying stars and planets. It seems that all three PixieDusts in this collection are similar since they are not super textured, and have a jelly-like base that is pretty sheer in one coat. However Imogen is a little more sheer to me, perhaps just less pigmented, but I felt like I needed three coats of this one to make it more opaque. The benefit of it not being so opaque is that the holographic glitter really shines through. These photos do not do it justice on the nail, but you can see how my camera really caught it in the bottle below! In general, this is yet another great collection from Zoya. While I am usually a huge fan of the PixieDust polishes, I think I'm actually loving the three "normal" polishes more this time around - especially Haven! You can purchase the Wishes collection from zoya.com now. Haven, Prim, and Willa are $9 each, and the PixieDusts (Nori, Thea, and Imogen) are $10 each. A sampler of all six full size polishes is $57. Happy Halloween, everyone! I've been slacking a bit on the holiday nail art this year, but I thought I would do something somewhat simple yet festive this time around. So I decided to go with candy corn themed nails! I'll keep this a little short and to-the-point since they're a little simple, but I love them! I've been wearing them all week and have gotten lots of compliments on them. My nail shape doesn't really suit the candy corn theme I suppose, but I still love the bright yet autumn colors. I used three polishes for these nails: Zoya Creamy, Zoya Sharon, and Zoya Purity. I began by painting each nail with a coat of Creamy to get a nice, even base going. I then carefully tried to freehand Sharon across each nail for the orange part. You can see it isn't quite perfect, but I was strapped for time and couldn't wait for it to be solid and use tape! I then did the same thing with Purity for the white tips. I know I've been on a Born Pretty Store kick this week, but I I'm also really glad I finally got to do some nail art! This time I have some chevron decals to easily make chevron designs. I've really been loving Zoya's Veronica for fall, so I wanted to try to dress that color up a bit. I went with applying Rainbow Honey's Judgement Bolt over it in a chevron pattern with these chevron decals. In retrospect, I probably should have just used a plain gold polish instead of a glittery polish, but I'm still loving the finished product! I started by applying a couple coats of Zoya Veronica. After that was dry, I cut the chevron strips in half, and applied a couple to each nail, leaving enough space between them to make the lines about even. I then applied a couple generous coats of Rainbow Honey Judgement Bolt over the decals. It looks really messy here, but hey that's what the decals are for! Unfortunately it took more of this polish to build up than I thought, so I sort of wish I used just a normal gold polish instead of glitter, or at least a coat of opaque gold and then a layer of glitter. Ah well, next time! After applying the glitter, I carefully peeled off each chevron strip. You can see below before I applied topcoat and finished it off, that it wasn't perfect, but the lines were still pretty clean. I feel like I waited a little too long after applying Judgement Bolt to remove the strips, so don't wait until it's practically dry to peel them off! Otherwise, another tip would be to carefully peel them off with tweezers, and sort of follow the zigzag pattern for the direction you're pulling. After this photo, I applied a generous layer of Seche Vite topcoat to fill in the gaps, and you can see the finished product at the top of this post. The pattern is very eye-catching, and I will definitely be using the decals for more designs! I didn't even use half of the stickers, so I have enough for at least one more full manicure. I feel like while it was just user error with the thick glitter not turning out perfect, these decals work way better than normal Scotch tape for me. I will be ordering a few more sheets myself! Each sheet is currently $1.58, but you definitely get more than one use out of each sheet. And as always, they have free shipping worldwide! Don't forget to use code BCL91 for 10% off of your order too!